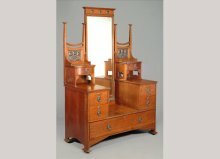 A Heals and Co Arts and Crafts oak bedroom suite of superior quality designed by Ambrose Heals consisting of a treble wardrobe, dressing table, a pair of 3' wide beds which can easily be made into a 6' wide king size bed just by butting the two singles together, and a matching bedroom chair. 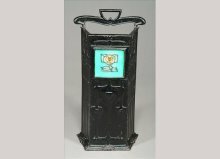 Sir Ambrose Heal (1872-1959) for Heal and Son, a laurel and inlaid Signed Edition Series bookcase, 1929, with ebony lines and abalone highlights, with a shaped cornice above two glazed doors, the base with two slides with ivory buttons above panel doors, on a plinth, labels and ivorine circular disc, 194cm high, 92cm wide, 47cm deep With original sale label and formerly owned by the Fine Art Society, stock number 13562. 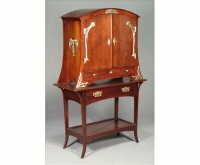 See Cooper, Jeremy 'Victorian and Edwardian Furniture and Interiors', fig. 600 opposite p. 225. 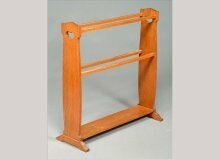 Sir Ambrose Heal (1872-1959) for Heal and Sons, an oak towel rail, with heart cut-outs, 84cm high, 79cm wide, 17cm deep. See Heal's catalogue of Bedsteads, Bedding and Bedroom Furniture (139th edition), p. 27 for an illustration of this design no. 246. 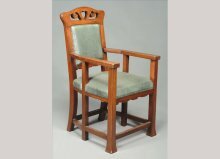 Sir Ambrose Heal attributed for Heal and Son, an oak six-legged armchair, re-upholstered in green leather, with a heart and scroll cut-out top rail, 112cm high. 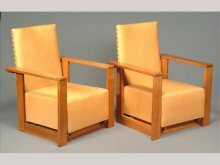 W. H. (Curly) Russell (1906-1971) for Gordon Russell, a number of oak recliner armchairs, designed 1930, three re-upholstered in fawn leather, 89cm high (upright) Provenance: these were made for Overstrand Hall which was designed by Sir Edward Lutyens in 1899-1900. They date to when the hall was turned into a convalescent home in 1931-32. See 'R D Russell Marian Pepler' exhibition catalogue, London 1983, p. 5 for an illustration of the living room Lobden in 1932 with an example of this model of chair. 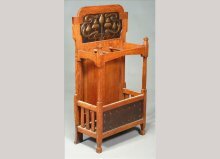 An Arts and Crafts oak and pewter hall bench, extensively carved with scroll foliage, Celtic knotwork, dragons, elves and imps, 126cm high, 142cm wide, 58cm deep. Unattributed, a wood carver's real tour de force, possibly of Irish origin. 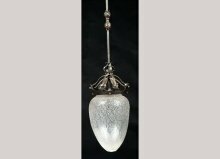 An Arts and Crafts wrought iron and crackle glass ceiling light, 115cm high, 25cm diameter. 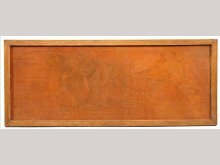 Shapland and Petter, an oak and marquetry sideboard, the mirrored and shelved back with two glazed doors covered with lattice and embossed copper grilles, inlaid throughout with formalised floral marquetry, stamped 'SandPB' to the locks, 178cm high, 152cm wide, 60cm deep. 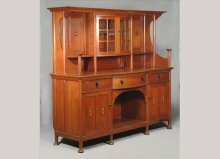 For a similar example see Bennett, Daryl 'Shapland and Petter Ltd of Barnstaple: Arts and Crafts Furniture' Barnstaple 2005, p. 8. 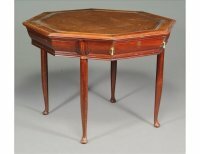 Shapland and Petter, Barnstaple, a set of four oak tables, with rounded square tops, square section splay supports with undertiers and block feet, comprising: a high plantstand, 116.5cm high; a low plantstand, 88cm high; a tile-top chess table, 78cm high; and a similar table, 78cm high. 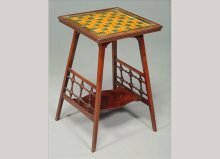 Shapland and Petter, Barnstaple, a mahogany and tile-top chess table, with a 'wavy edge' square top, square splay supports, an undertier and turned lattice panels, 65cm high, 41cm square. Shapland and Petter designed the machine to cut the wavy edge, making it a design feature unique to them. 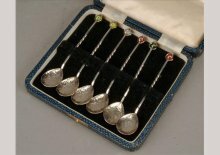 Harold Sargison, a set of six hammered silver coloured small spoons, stamped �Sargison�s Stg�, each with a different coloured semi-precious bnall terminal secured with entwined wire, 10.5cm long (4.25in) long, in a case Sargison's, Hobart, Tasmania, Australia, fl. 1920 - 1940. An identical spoon to this set was presented to the Powerhouse Museum, Sydney in 2002. The collection was assembled in the 1980s by Dr G W Kenneth Cavill, an Emeritus Professor of the University of New South Wales. 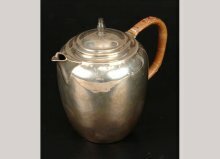 In his retirement, Professor Cavill has researched and published the histories of notable Australian silverware manufacturers of the first part of the 20th century. An Arts and Crafts 6 inch tile tea pot stand, the tile with a Dutch boy and girl, a windmill in the beyond, in a wicker frame 19cm x 19cm overall These tiles were used by Liberty and Co and in Shapland and Petter furniture. 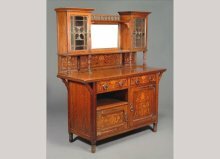 Shapland and Petter, Barnstaple, a mahogany small bureau, the glazed door with an embossed copper grille, a drawer, an open shelf and with shaped supports, with the patented wavy moulding to the drop-down writing area and lift-up flaps to the side, 132cm high, 72cm wide, 41cm deep. 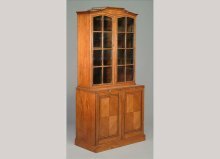 Shapland and Petter, Barnstaple, a mahogany and marquetry display cabinet, with a swollen square spindle gallery, floral inlaid panels, two glazed doors and on block feet, stamped 'SandP' over 'B', 163cm high, 118cm wide, 35cm deep. 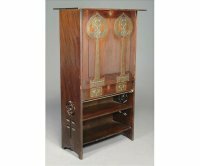 Shapland and Petter, Barnstaple, an oak and embossed copper stickstand, with stylised plant and roundel embossed panels stamped 'R1415 42', 102cm high, 53cm wide, 27cm deep. 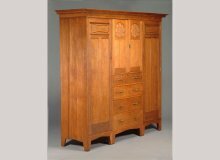 Shapland and Petter, Barnstaple, an oak wardrobe and dressing table, with embossed copper roundels and furniture, the triple wardrobe 211cm high, 200cm wide, 62cm deep; dressing table 164.5cm high, 122cm wide, 59cm deep. 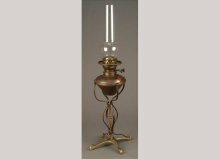 William Arthur Smith Benson (1854-1924), a brass and copper standard oil lamp, 98cm high overall. 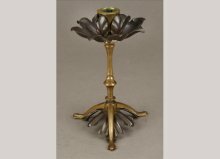 William Arthur Smith Benson, a pair of brass and copper candlestick, 18.5cm high. 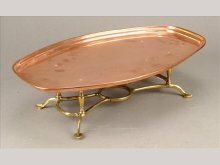 William Arthur Smith Benson (1854-1924), a copper tray with chased flowers, stamped mark, 47cm long, 28cm wide. See Hamerton, Ian (ed) 'W.A.S. 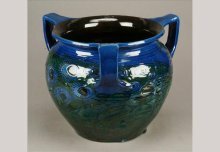 Benson: Arts and Crafts Luminary and Pioneer of Modern Design' Woodbridge 2005, p. 80, plate 52 and p. 254, plate 25. 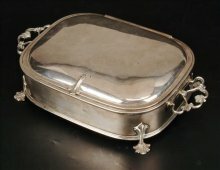 William Arthur Smith Benson (1854-1924), a rare electro-plated twin-handled oblong jewellery casket, stamped hammers mark, 30cm wide. 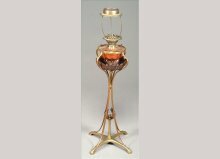 William Arthur Smith Benson (1854-1924), a copper and brass table oil lamp, with removable font, 47cm high. 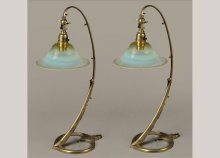 William Arthur Smith Benson (1854-1924), a pair of brass and vaseline glass swan table/wall lights, 48cm high. 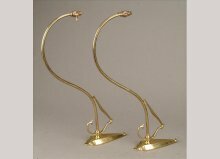 William Arthur Smith Benson (1854-1924), a pair of brass picture wall light brackets, these are unusually long designed to light up a pair of large paintings, 49cm long. 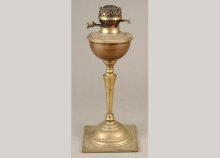 William Arthur Smith Benson (1854-1924), a brass and copper oil lamp, 45cm high overall. 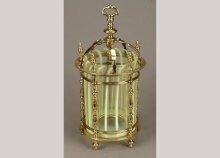 An Arts and Crafts turned brass and striped vaseline glass hall lantern, Height 15" and overall diameter 7 3/4". 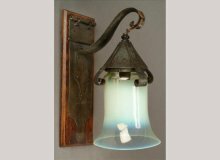 Similar lanterns of this type are found in the Benson catalogue. 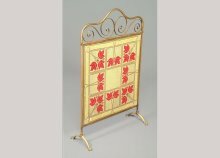 An Arts and Crafts brass and tapestry firescreen, in the manner of William Arthur Smith Benson, 100cm high, 64cm wide. The quality of this screen and the feet of this screen are identical to details of Benson lighting. 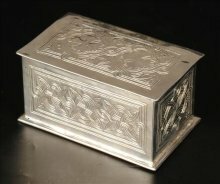 William Henry Mawson for Keswick Home Industries, an Arts and Crafts electro-plated rectangular box, with Celtic knot decoration, stamped mark, no. 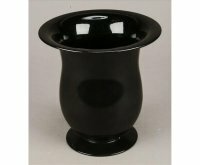 998, 7 cm high, 13.5cm wide, 8cm deep. 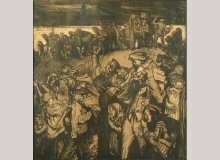 Sir Frank Brangwyn, RA (1867-1956), an oak elbow chair, the square back with carved ram's horns, re-upholstered leather seat, square supports joined by stretchers, 89cm high See 'Frank Brangwyn 1867-1956' Leeds Museums and Galleries 2006, p. 149 for an illustration of these chairs in situ. 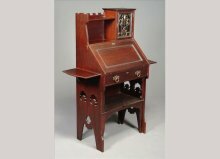 See also Andrews, John 'Arts and Crafts Furniture' Antique Collectors Club, p. 201. 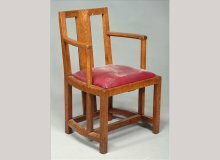 This chair was designed by Brangwyn for the first class dining room the 'Salle Jacques Cartier' of the Canadian Pacific liner, the SS Empress of Britain. She was launched in 1931 by the Prince of Wales, later Edward VIII. 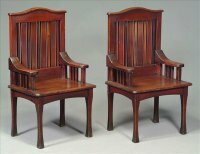 The chairs were made by H. H. Martyn and Co., Cheltenham. 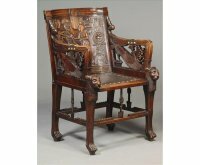 Sir Frank Brangwyn (attributed), a pair of mahogany armchairs, in Chinese style with re-upholstered leather padded back and drop-in seat, 86cm high. 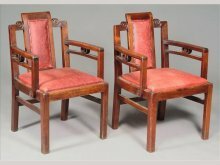 These chairs share stylistic qualities with the famous armchairs he designed for the Salle Jacques Cartier aboard the SS Empress of Britain, see following lot. He also designed two private dining areas, the Salle Wolfe and Salle Montcalm. These chairs retain the stay bars for securing them during heavy weather. 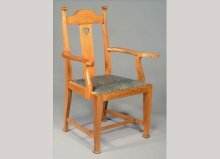 Walter Frederick Cave (attributed), an oak armchair, curved back with heart cut-out to the splat, drop-in seat, on square tapering supports, 111cm high. 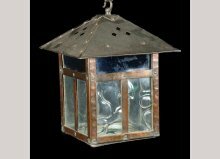 An Arts and Crafts copper and glass square hall lantern, 53cm high, 26cm square. 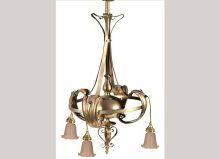 An Arts and Crafts brass ceiling light, with exaggerated scrolls framing the shaft and supporting the corona and four hanging glass shades, 112cm high, 69cm diameter. 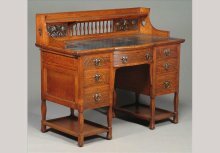 Waring and Gillow, a chequer, ebony and boxwood inlaid walnut sideboard, in the manner of M.H. Ballie, labelled, 188cm high, 202cm wide, 71cm deep. Under close inspection of the label it says 'Waring and Gillow', the 'Gillow' being so small one can only see it under an eye glass. 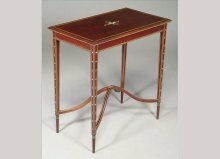 A mahogany and inlaid rectangular occasional table, circa 1880, with mother of pearl, copper, brass and ivory floral inlays, 71cm high, 69cm wide, 40cm deep. 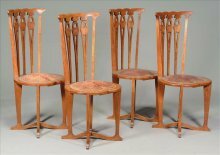 A rare set of four Arts and Crafts side chairs, probably Scottish and possibly by George Logan or John Ednie, the back splats pierced with hearts, the heart shaped seats with the original tooled leather upholstery secured by studs, on an X-stretcher base, 102cm high. 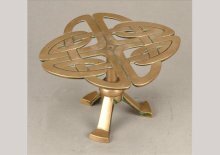 Margaret Gilmour (attributed), a Glasgow School brass trivet, with Celtic knot decoration, 11cm high, 18cm wide. 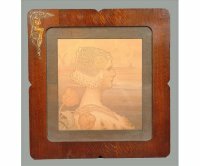 Margaret Thomson Wilson (1864-1912), a pair of embossed copper and oak panels, signed 'MTW' in a square, 33cm x 27cm. 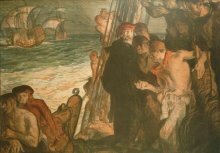 Margaret Thomson Wilson was born in Cambuslang in 1864 and died suddenly in Glasgow in 1912. 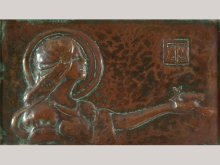 She enrolled as a student at the Glasgow School of Art in 1892 where she participated in a wide variety of disciplines but most particularly her emphasis was on repousse metalwork. 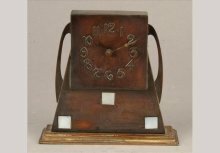 Glasgow School, a patinated metal and mother of pearl desk clock, circa 1900, with an integral key wind timepiece movement, 16cm high. 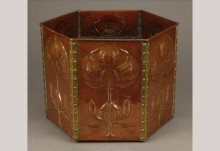 Margaret Gilmour (attributed), a Glasgow School embossed brass square planter, 21cm high, 27.5cm square. 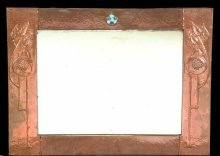 Glasgow School, an Arts and Crafts hammered copper rectangular wall mirror, embossed with pomegranates and stylised foliage and an enamel roundel, 56cm high, 76cm wide. 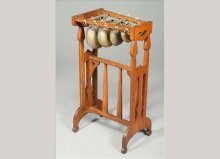 George Walton (1867-1933), an Arts and Crafts oak xylophone, with squashed heart details to each side and with six graduated brass bars with circular resonators, 76.5cm high. 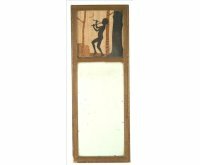 Originally designed for the snooker room in Leys Hall. See Moon, Karen 'George Walton: Designer and Architect' Oxford 1993, p. 89, pl. 115 for an illustration, (Images attached). Alexander Ritche (1856-1941) of Iona, an Arts and Crafts part hammered brass oval wall mirror, with embossed Celtic knotwork and longship roundels, 39cm high, 82cm wide. 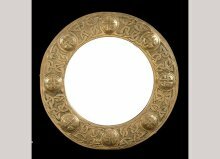 Glasgow School, an Arts and Crafts hammered brass circular wall mirror, embossed with Celtic interlacing and knot roundels, 61cm diameter. 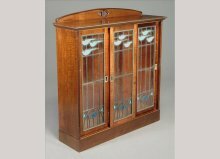 George Logan (d. 1939) for Wylie and Lochhead, a carved walnut display cabinet, circa 1901, the low back carved with a butterfly to a pierced reserve, with three coloured and leaded glass doors with birds in flight and harebells, 122cm high, 119cm wide A bedroom suite which he designed for the Wylie and Lochhead Pavilion at the exhibition of 1901 also has harebells and small carved butterflies which are almost identical, it is possible that this cabinet was exhibited. Talwin Morris (attributed), a rare Glasgow School cast iron stick, inset with the original tubelined tile of a Glasgow Rose, probably by Pilkington's, cast 'No 176' and 'Rd No 479021', 72.5cm high, 37.5cm wide, 18cm deep. Talwin Morris has in the past been counted as the fifth member of the Glasgow Four, because of his maturity and long standing friendship with 'The Spook School' of Charles Rennie Mackintosh, Herbert Macnair, and Margaret and Francis Macdonald. 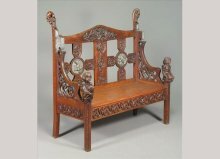 Ernest Archibald Taylor (1874-1951) for Wylie and Lochhead , a rare 'Butterfly' chair, the high back with satinwood and mother of pearl inlaid flowerheads to the head rail and inlaid butterflies to the central back, 83cm high. 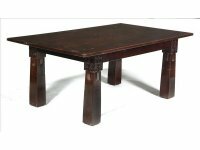 Glasgow School, a bold mahogany dining table, circa 1900, attributed to M H Ballie Scott, carved with panels of stylised plants to the heads of the square inverse tapered legs, 72.5cm high, Approx 175cm wide, 125cm deep. 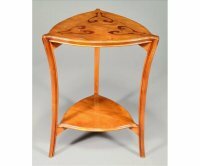 The design of this table is very pure to the Scottish Arts and Crafts Movement, it is certainly by a good designer and is a very accomplished design and with well chosen woods. It has butterfly joints underneath to each corner showing a true understanding of quality. 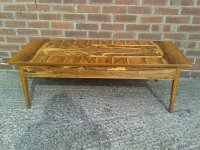 This table was purchased in Liverpool by Anthony Geering and Martin Wolfson from the previous owner, who states that they originally came from Liverpool College of Art. 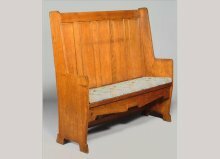 Ernest Archibald Taylor (attributed), an oak panelled settle, with a later squab cushion, 129cm high 137cm wide, 43cm deep. 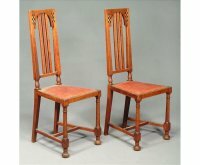 In the style of George Walton, a pair of oak and inlaid side chairs, circa 1903, with studded leather seats, stamped mark, 105cm high. 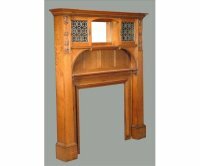 Wylie and Lochhead, a carved oak, mirrored and leaded glass mantelpiece, 200cm high, 173cm wide, 30cm deep. 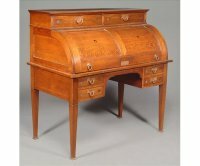 A Continental Secessionist oak and inlaid cylinder desk in the Glasgow style, with copper handles, cut-out roundels and ebony and mother of pearl stylised flowerheads, stamped on several drawers 'GLASGOW', 124cm high, 125cm wide, 70cm deep. 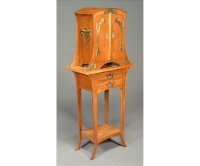 Charles Rennie Mackintosh (1868-1928), a cypress wood and brass writing cabinet, formerly green stained, with cut-out stylised foliate hinges, the drawer with conforming handles, the base with two shelves, 159cm high, 96cm wide, 45cm deep Provenance: by descent from the relatives of James Guthrie. 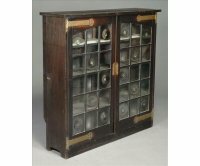 This writing cabinet was consigned to McTears, Auction House in Glasgow, together with a collection of items, as part of a house clearance, including silver, brassware with 'Guthrie' stamped in bold writing onto two separate chargers, two watercolours and an oil painting by Guthrie. 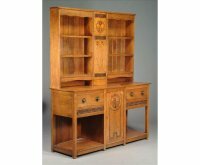 This secretaire and a sideboard, both part of this consignment, were both made from cypress wood and designed by Mackintosh. 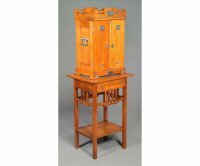 Charles Rennie Mackintosh (attributed) a Glasgow School green stained cypress wood and glazed bookcase, with bullion glazed doors with arched upper details and pierced brass hinges and square cut-out lock plates, 126cm high, 127cm wide, 34cm deep The bookcase has much in common with the above lot, made from cypress wood with stylised brass hinges that are certainly in the same style as much of Mackintosh's work at this time. The lock plates with square cut-out details are also common in much of Mackintosh's furniture and interiors and would particularly point to him. This bookcase was also purchased in Glasgow in 2009. The pattern of the bullions are assymetrical and flow through the doors. In the top two central panes, the glass is longer to fulfil the design. 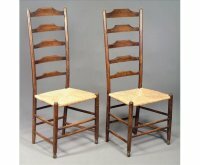 A pair of green stained ash and beech ladder back chairs, with re-rushed seats. 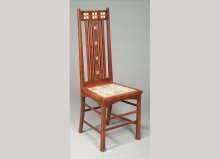 Although these chairs are associated with Mackintosh for both the Gauld furniture and other pieces for William Davidson, they were not designed by Mackintosh. 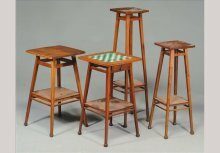 Mackintosh would have seen them at the various exhibitions going on at the time and may have used them for their timeless beauty and exaggerated high backs something he was continually using in his own chair designs. 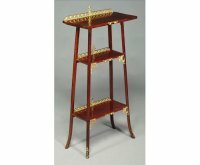 The unusual use of balls to the feet are quite different to all other traditional ladder backs and do fall into the Arts and Crafts Movement and were made by Phillip Clissett. 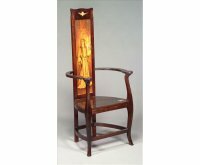 An early Egyptian Revival King Tut carved walnut elbow chair, the curved back with a pharonic figural scene, a leather seat and arm pads with brass studs, the front legs lion headed, on paw feet, 100cm high. Modelled on Tutankhamun's Golden Throne discovered by Howard Carter in 1922, now in the Egyptian Museum, Cairo. 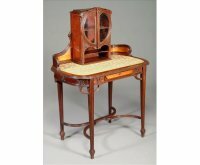 See Sothebys March 5th and 6th. 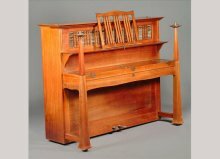 Auction of the late Stanley J. Seeger lot 226 where a gilt, gesso and pine variation made in 1925 realised £37,500.oo. 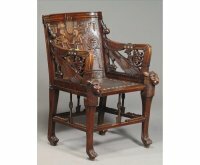 An early Egyptian Revival carved walnut elbow chair, the curved back with a pharonic figural scene, a leather seat and arm pads with brass studs, the front legs lion headed, on paw feet, 100cm high. Modelled on Tutankhamun's Golden Throne discovered by Howard Carter in 1922 and now in the Egyptian Museum, Cairo. 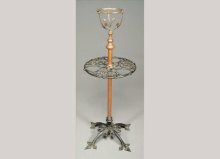 WMF, an Art Nouveau electro-plated table service for twenty four in an oak cabinet on stand, pattern 37, circa 1904-14, comprising: Twenty four table knives Twenty four table forks Twenty four table spoons Twenty four dessert knives Twenty four dessert forks Twenty four dessert spoons Twenty four fish knives Twenty four fish forks Two pairs of fish servers Two fish serving spoons Four butter knives Eighteen knife rests Twenty four tea spoons Two sugar sifting spoons Twenty four small fruit spoons Twenty four smaller spoons Eighteen individual asparagus tongs Six salt cellars with liners Six salt spoons. 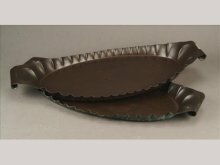 Two soup ladles Two gravy ladles Two carving knives and forks Two pairs of salad serving spoons, (334) the cabinet with silvered metal pierced mounts, a fitted interior and drawers, on a single-drawer stand, 155cm high overall, 98cm wide, 44cm deep. 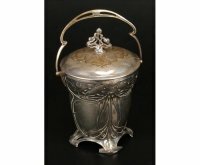 WMF, an Art Nouveau silvered metal biscuit box and cover, with a swing handle, stamped mark, no. 338, 22cm high. 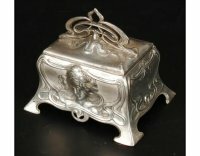 WMF, an Art Nouveau pewter casket, cast with maiden's heads, stamped mark, 15cm wide. 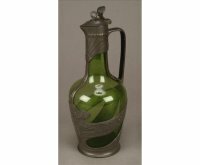 Orivit, a pewter and green glass wine jug, 30cm high. Design no. 1211. 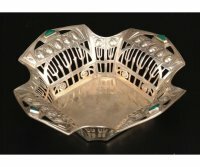 For an identical version with stamped marks see Christie's sale 'Art Nouveau' 12th October 2004, lot 239. 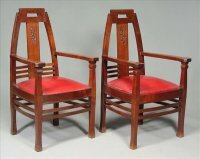 Peter Berhens (attributed), a pair of Jugendstil mahogany armchairs, the seats re-upholstered in red leather, 110cm high See Whiteway, Michael and Gere, Charlotte 'Nineteenth-Century Design From Pugin to Mackintosh' London 1993, p. 262, plate 333 for a side chair of a similar pattern. 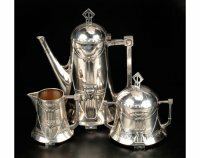 Albert Meyer for WMF, an Art Nouveau electro-plated table service for twelve settings by WMF, pattern 44, designed circa 1905, comprising: Twelve table knives Twelve table forks Twelve table spoons Twelve dessert knives Twelve dessert forks Twelve dessert spoons Twelve tea spoons Ten knife rests A carving knife and fork A soup ladle A dessert serving spoon A salad serving spoon. 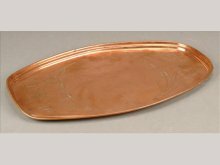 A salad serving spoon with forked end in an oak and brass mounted dome-top cabinet, on a two-drawer stand, 146cm high overall, 64cm wide, 38cm deep. 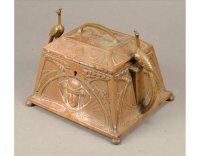 WMF, a German Jugendstil embossed copper plated casket, with twin peacock handles, stamped mark, 18.5cm high, 25cm wide. 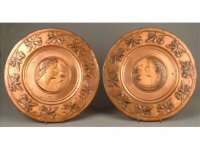 WMF, a pair of brass wall plaques, the centres embossed with a lady's and gentleman's heads within running strawberry borders, 43.5cm diameter. Albert Mayer for WMF, an electro-plated part table service for twelve in an oak cabinet by WMF, pattern 44, designed circa 1905, in production circa 1905-14, comprising: Eleven table knives Twelve table forks Twelve table spoons Eleven dessert knives Ten dessert forks Twelve dessert spoons Twelve fish knives Twelve fish forks Ten tea spoons A sugar sifting spoon Twelve knife rests Two salt cellars with liners Two salt spoons A carving knife and fork A soup ladle A gravy ladle A pair of fish servers A dessert serving spoon A pair of salad servers in a light oak Jugendstil cabinet on stand with silvered metal mounts, the fitted interior with a drawer, on a single-drawer stand, 149cm high, 55cm wide, 44cm deep. 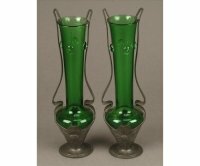 Weiner Werkstette, a green glass vase by Moser, Karlsbad, 1923-33, acid etched mark and Made in Czechoslovakia, 20.5cm high. 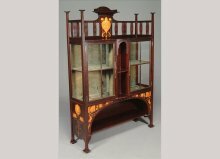 A Continental Art Nouveau mahogany and gilt metal etagere, the mounts pierced with running scrolls and foliage, 123cm high, 60cm wide, 30cm deep. 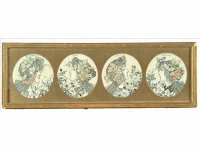 A set of four French Art Nouveau woven silk roundels, of the four seasons, each titled, each 13cm diameter, framed as one. 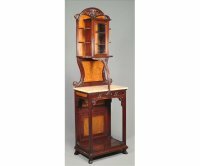 Nancy School, a French Art Nouveau cherry and inlaid two-tier table, triform with moulded and curved supports, 77cm high, 57cm wide. 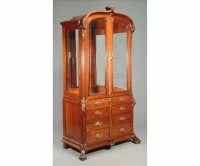 A French Art Nouveau walnut display cabinet, with foliate carving, an arch top, two bevelled glazed doors, eight drawers with Art Nouveau gilt brass handles, on foliate scroll feet, 230cm high, 130cm wide, 70cm deep. This is a good example of Nancy School work. 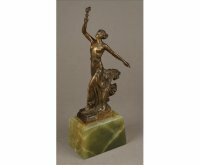 B.V. Fernandez, an Art Deco bronze figure, of a bare-breasted torch bearer, impressed 'Fernandez' and 'Uruguay 252', on a green onyx base, 35cm high overall. 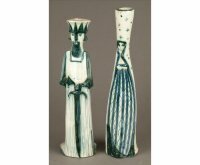 David Sharp (1932-1993) for Rye Pottery, a pair of chessmen candlesticks, painted marks, the king 35cm high, the queen 37cm high. 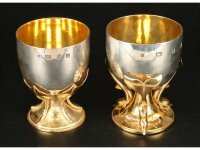 Two silver parcel gilt goblets, maker's mark 'HL' in a shield, London 1980 and 1994, one with three dolphin supports (NOW SOLD), the other leaves, 11.5cm (4.5in) high, 779g (25 oz) gross The mark is of Hugh Alexander Forbes Latimer. He has been registered with Goldsmith's Hall since 1971. 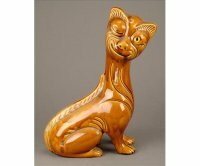 A pottery figure of an amusing seated cat winking, mid 20th century, ochre glazed with a glass eye, unmarked, 42cm high.